Many statements worthy of close study in this lecture, one of which you have highlighted: that DW is not “the EF in English”. I have seen variations of this phrase in Facebook reviews and similar,places—no doubt simply meant to catch the interest of those who prefer more traditional liturgy—but it is good to see this idea clearly refuted. Bp Lopes also says that celebration ad orientem is the norm in most OCSP liturgies because that was the practice in the predecessor Anglican communities and forcing change would have been pastorally “unnecessary and disadvantageous”, but that DW can be used versus populum “if the architecture or a parish’s particular experience suggest that it is more appropriate”. So he is declining to get on the “ad oreintm” bandwagon in a tendentious way. I have noted that he is generally collegial in this manner, rather than of the “let’s circle the wagons” school, which is an attitude I think Ordinariate members in general need to avoid. This is indeed a profound lecture, and well worth the time that it takes to read and understand it. The text provides phenomenal insights into both the heritage and the structure of the Divine Worship missal, many of which may well be unfamiliar even to members of the ordinariate who have not had the opportunity to visit ordinariate communities other than their own, in which various customs and adaptations permitted by the rubrics that differ from the customs of their own communities may prevail. From the standpoint of future growth of the ordinariates, the fact that the Divine Worship missal allows each community considerable flexibility to continue the practices that it followed before its reception into the full communion of the Catholic Church is also very significant. Anglican communities who are discerning their options undoubtedly will find these provisions of the rubrics to be very welcoming! Norm, regarding “Anglican communities who are discerning their options”—do you think any more of these exist? The last group to come into the OCSP with their former Anglican clergyman was St Michael and All Angels, Denison, in March 2015. Since then there have been gathered groups, of course, but they have had to develop their worship practices from scratch, as it were. I think that will be the way forward. That does not mean that flexibility will not be appreciated, of course. I’m not sure that any of this is as simple as you portray it. But yes, there undoubtedly are Anglican communities that are still discerning their options, not the least of which is a rather large and nearly global body — the Global Anglican Futures Conference (GAFCon). But there are also congregations in various “continuing Anglican” bodies that took a “wait and see” attitude when the ordinariate first formed that may now be ready to commit based on the stability that they now see, and congregations in the Church of England that took a “wait and see” attitude with respect to the implementation of the supposed accommodation for the Anglo-Catholic communities within the Church of England but are finding that the “accommodation” is not adequate, and there undoubtedly will be congregations that will decide that some future “progressive” “reform” is one step too far and thus will be looking a viable alternative to where they are now. It’s all in the timing. And then there are also some from various Protestant traditions who hear the call to full unity but who want to preserve their ecclesial structures and traditions, to whom the ordinariates are pointing the way forward. BTW, note that both the Personal Ordinariate of Our Lady of Walsingham and the Personal Ordinariate of the Chair of St. Peter are several times the size of the smaller sui juris ritual churches, which have endured for centuries. Also, the Personal Ordinariate of the Chair of St. Peter has more parishes than the Diocese of Juneau here in the United States. Putting “undoubtedly” in a sentence does not constitute evidence, in my opinion, and so far not a single congregation from the “Low Church” end of Anglicanism has entered an Ordinariate. I cannot envision a group of people from a parish which does not even have a Eucharist as the main Sunday service or a clergyman who wears a stole seeing the Catholic Church as the way forward. Just in time to participate in a centenary pilgrimage to Fatima? Individuals, of course, but not groups. In any event, tying the fortunes of the Ordinariates to the misfortunes of Anglicanism as a denomination puts them in the same position as the “continung” churches ie rooting for the demise of the very body on which they are dependant. Furthermore, the ordination of women was an issue on which the “anti” credentials of the Church were obvious to all. If I join the Church to ensure that my priest is a man I can be completely confident that my expectations will be met. I do not think that non-Catholics perceive the Church as a place to go to get away from gays, frankly. You are correct about evidence — but in most cases there won’t be any public evidence of intent until something actually happens. A public statement to the effect that a clergyman or congregation is even considering the option to join an ordinariate would, in the preponderance of cases, draw immediate ire from their present denominational leadership, so the Catholic Church handles these matters very discretely and with extreme confidentiality until the move actually occurs. So the bottom line here is that you can’t draw any conclusion, either way, from the absence of news. However, Fr. Perkins did indicate that there has been a steady stream if inquiries and that he is in discussions with more than a few Anglican and possibly Protestant clergymen about coming into the ordinariate with their congregations in an interview a while back. http://livingchurch.org/2016/11/18/ky-priest-joins-ordinariate/ Of course there is a press release ; I select this example from amoong many. However, this was not an instance where a clergyman brought in a group from his former parish, which is what we are discussing. 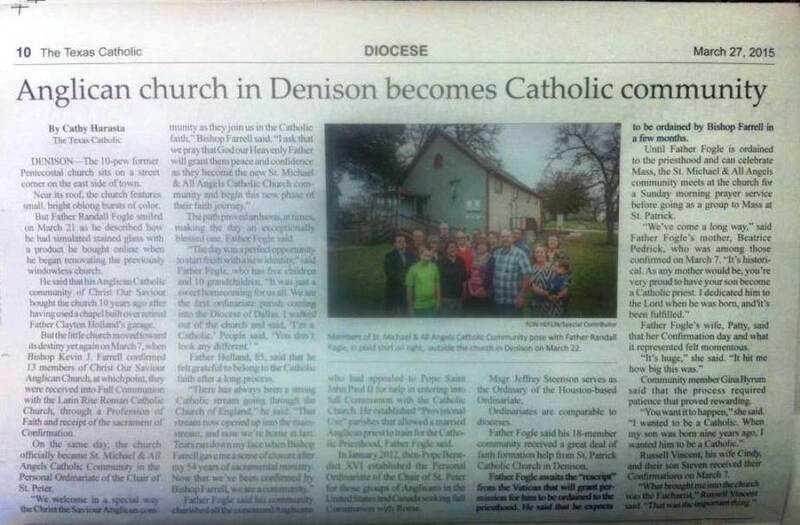 I was looking for the article in the March 27, 2015 issue of the Texas Catholic which covered the story of the reception of St Michael and All Angels, Denison and found here https://ordinariateexpats.files.wordpress.com/2015/08/st-michael-and-all-angels-denison1.jpg not only a link to the article but a previous discussion, probably one of many, on the relationship of the information on the OCSP website’s parish list to ccurrent reality.